Back in the 60’s I toured Europe extensively as a musician and during this time I worked with several world class guitarists - superb musicians. But one thing that they all had in common was that none of them could read music. Ironically, I could read music having had a fairly extensive classical training, yet these guys were teaching me stuff that I’d never heard of. 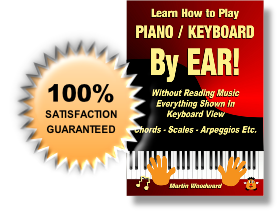 Since those times I’ve written a few books on keyboard tuition, mainly geared around learning to read music and playing techniques. But then I got thinking; during my time as a touring soul / funk / prog rock musician, although I could read music, I never actually needed to. When I first joined one particular backing band I was presented with some chord lines to follow, but that’s as close as it ever got. So I can emphatically say that learning to read music won’t improve your technical playing ability one iota! How can it? - one is theory, the other practice! So learning to read music is a total waste of time then? No, actually I think it’s a very good idea. I’m just saying it won’t improve your playing technique. It will help you copy other people and in some cases this can help you learn. But ultimately copying other people is not what it’s all about; - great musicians create! In this book you’ll find superb exercises to give you a great technique as well as all the theoretical information that you need - all without reading music. This book is unique and very comprehensive, you’ll not find anything like it anywhere else. All in all this is probably the most extensive book of its kind available, in fact probably the only book of its kind. Instant Download Version - only £5.99 IMPORTANT: After payment is complete click the BACK TO MERCHANT button where you will be redirected to where you can download the guide instantly!